Sometimes there is a real benefit in being able to bring your own way of thinking about a project or problem or discussion topic together with the thinking of others that you live with or work with. Sometimes it can be useful to do this with a coach or counsellor, and at other times, just with members of the team you’re working alongside. “In-the-world” thinking tools enable groups of people to think things through together, thereby extending the capacity of both our individual working memory, and the integration of each person’s thinking with the thinking of the whole team. People have been talking about crowd-thinking for years, but Thortspace enables crowd thinking at a new level of integration. How does crowd-thinking work in thortspace? In Thortspace, each participant on a sphere writes down their thoughts on small discs which reside on spheres as members of groups or as single thorts. In Thortspace, we call these discs “thorts”. So a thort is a graphical marker for a thought. As a container for text, a thort is big enough to contain one or two typical sentences. 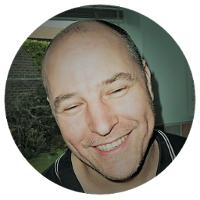 By entering their thoughts into thorts, Thortspace thereby enables collaborators to breakdown the structure of each participant’s thinking into sentence and phrase components which can now be played around with by all the participants on the sphere. The thoughts that collaborators write down can include their ideas, suggestions, research, sources of related information, questions they don’t know the answer to and so on. Thorts and groups of thorts can then be linked with other thorts and groups of thorts via a graphical device called a path, which can have a sequence of path-steps on it (a series of path-steps goes to make up a path). Ok, so now you know how to use Thortspace, but how do you get the crowd involved in your thinking? To share a private sphere that you are the owner of, you will need a Thortspace Premium Cloud Services account. 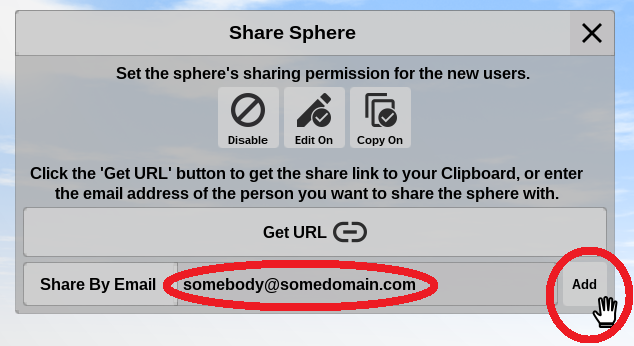 By the way, if someone shares a private sphere with you, you do not need to be a Subscriber to Premium Cloud (only the owner of the sphere needs to have a Trial or Subscription). The “owner” of the sphere, is the person who is in control of the access permissions for that sphere. The Share tab is the fourth tab down on the left-side tab panel. 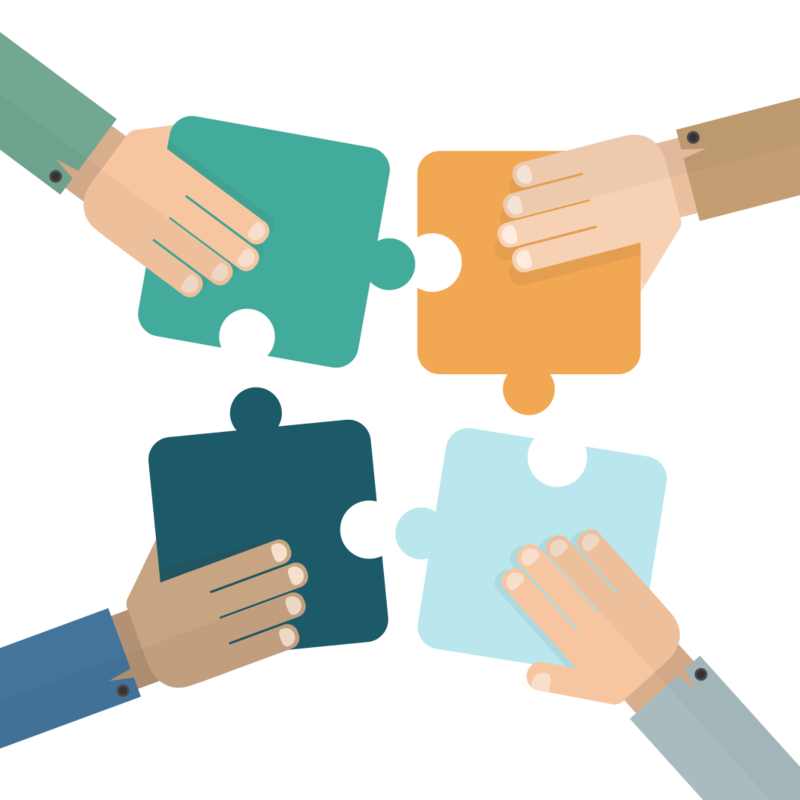 In this article below we are now going to look at how to do each of these three methods of adding collaborators in turn. 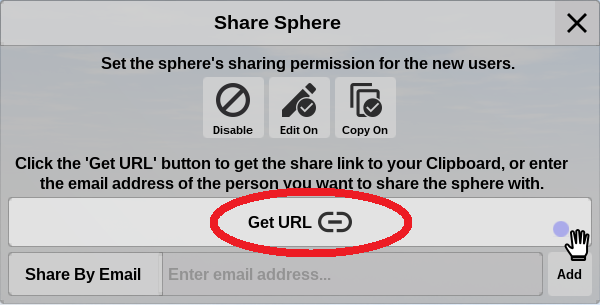 Click the “Share” button on the Share tab. The Sharing dialog box will open. 2. Enter the email address of the person you want to add as a collaborator, and click the Add button. The user will be added to the list of collaborators. The “Connect” button will now say “Friends” on it. 2. Click the Facebook button at the bottom of the Share tab. If you followed the connecting procedure in the article linked above, the button will say “Friends” on it underneath the Facebook logo. 3. The list will show you all the your facebook friends who have also connected their facebook accounts to thortspace. 4. 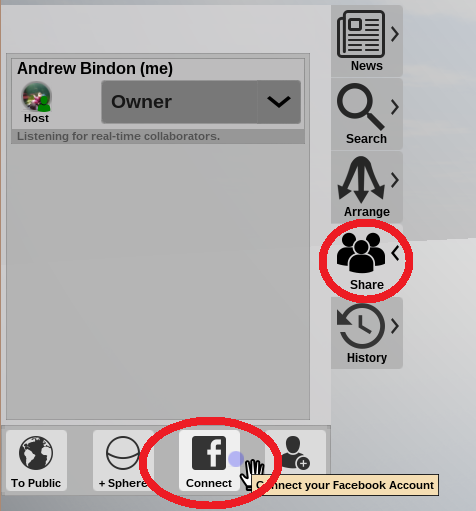 Click the Red switch next to your facebook friends to add them as collaborators on your sphere. The switch will change position are turn Green. 5. 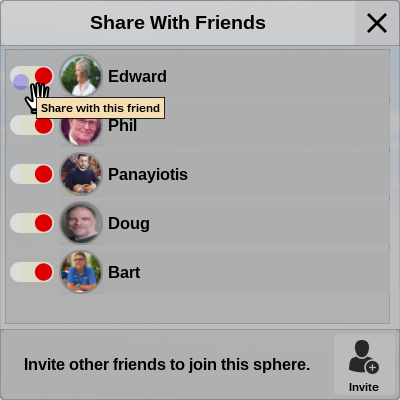 If few or none of your friends have connected Facebook to thortspace, you can invite them to collaborate on the sphere using the “Invite” button at the bottom of the Share With Friends dialog. 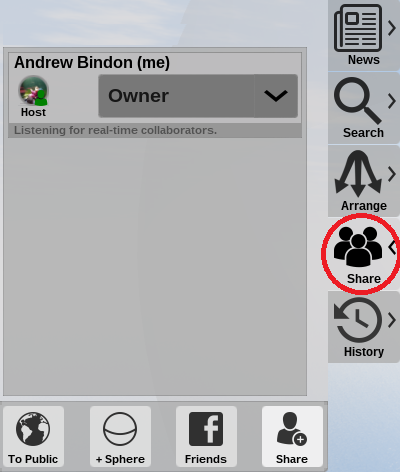 The last and probably easiest way to add collaborators to your sphere is by creating an invite link and sending it to people in a chat window or in an email. Anyone who gets access to the invite link will be able to access the sphere.